Lakshmi Menon is a published author of both fiction and nonfiction. She enjoys writing about kids, cooking, yoga, and Indian festivals. A superstition is a belief in something that is not justified by reason or evidence. It means to believe in something blindly without verification. Indian beliefs and superstitions are passed down from generation to generation. Most of these beliefs sprung up to provide protection from evil spirits, but some were based on scientific reasoning. Though Indian society is fast progressing, there are many people who are still superstitious and have a strong faith in these local beliefs. 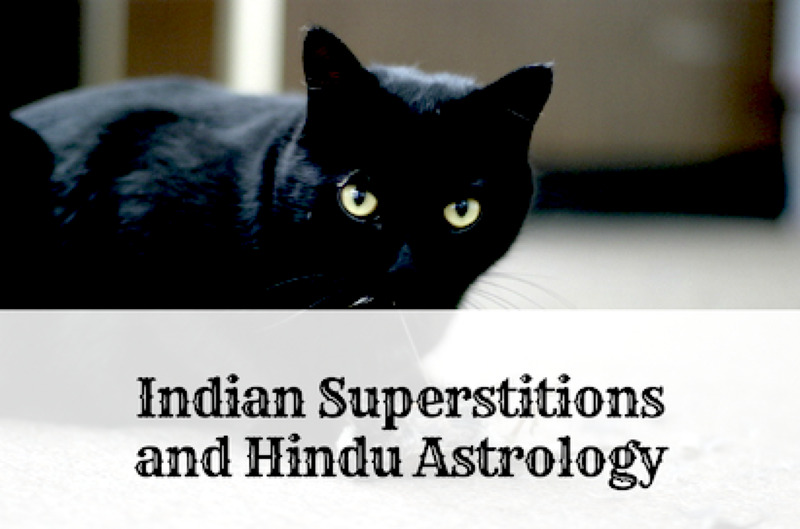 Superstitions are seen as important in India, because they often predict future occurrences, which can be either good or bad. 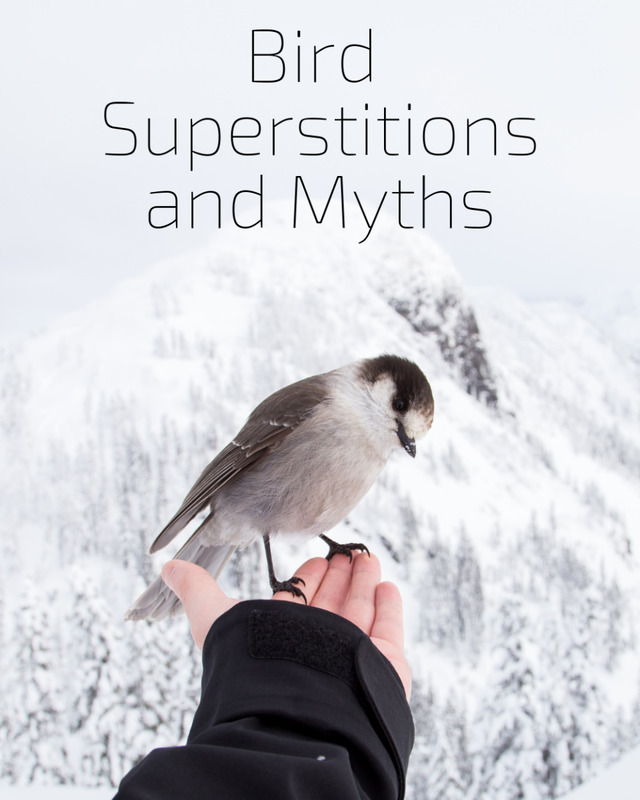 Though we try to believe these are baseless beliefs, somewhere deep inside our hearts, we are stuck to our roots and still believe in some of these superstitions, if not all of them. Since many Indians still hold these beliefs, it's important to understand their purpose and their historical context. Below you'll find detailed descriptions about Indian omens and Indian astrology. 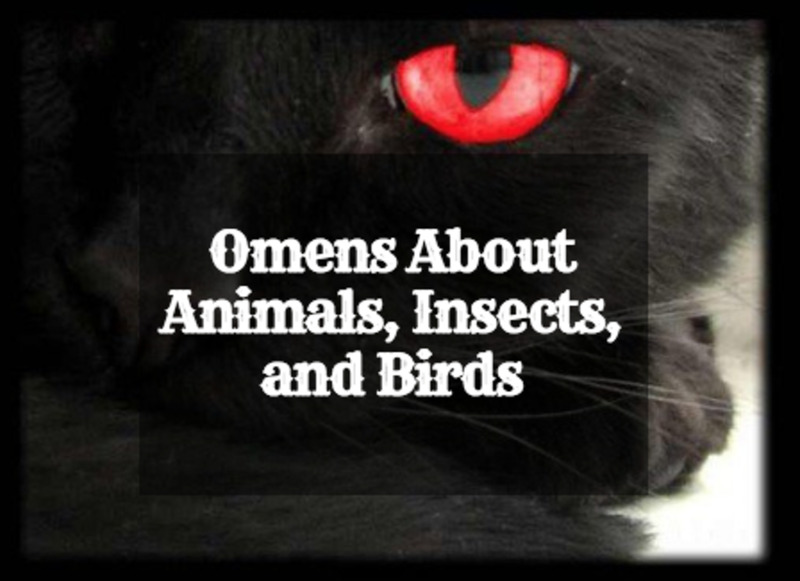 These are some of the superstitions which are considered good omens. When someone, who is going on a trip, sees a married lady with flowers on her head, and kumkum on her forehead, it is believed that the trip will be successful. 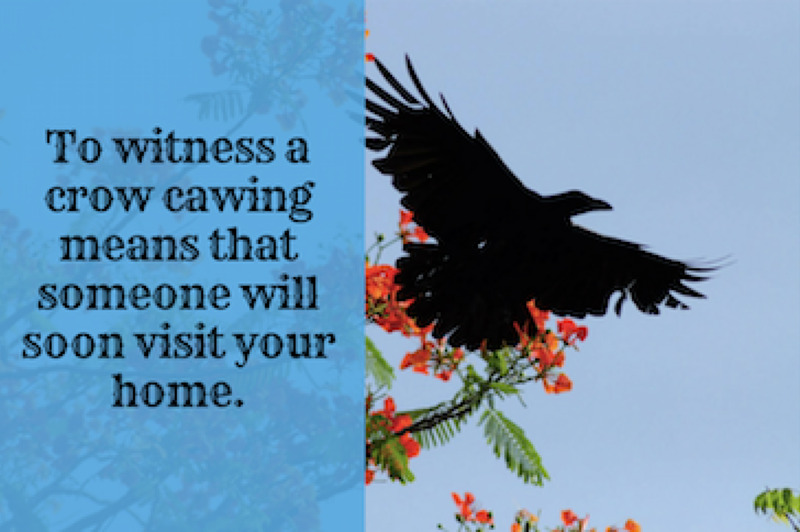 If you notice a crow cawing near your house, you are likely to get visitors to your house. If a girl's horoscope matches well with a boy's horoscope, at the time of their marriage, then they will have a successful married life. If you hear a lizard making a noise on the ceiling or on the wall, while a discussion is going on, it is a good omen, letting you know that the other person speaks the truth. A mirror, a pot full of water, a flag, a light, a pair of fish, and turmeric are all auspicious things to witness. When getting up from bed in the early morning, if a person is lucky to see any of these favorable articles, it will bring them good luck. They are also fortunate, if they see a lotus flower, gold, the ruler, light, the sun, fire, the sea, a temple tower, a hill with signs of rain, a cowing calf, his own right hand, a lunatic, a black monkey, an elephant, or a percussion instrument called a Mridanga. Seeing one's wife's face is also considered a good omen. To avoid seeing anything unpleasant in the morning, many people look at the palms of their hands as soon as they awaken and recite the invocation, "In the tips of the fingers resides Goddess Lakshmi; in the middle, Goddess Saraswathi; in the palm of the hand resides Goddess Parvathi; looking at my hands, I begin my day." The colour, spots, stripes, chirping, or twittering of a lizard, when it falls on a person's body, is said to predict the future. This can often be a good omen. Ants have always inspired humanity with their display of hard work and focussed efforts. They toil all-year-round. So, anything to do with them can only spell good fortune. There are several signs of bad omens in Indian society. Many people, even these days, avoid these omens as much as possible. Whether they believe in it or not, they are not prepared to take the risk. If you are going somewhere and see a cat, especially black, it is considered to be a very bad omen. Continuous hiccups are considered a sign that someone close to you is remembering you in a negative way. 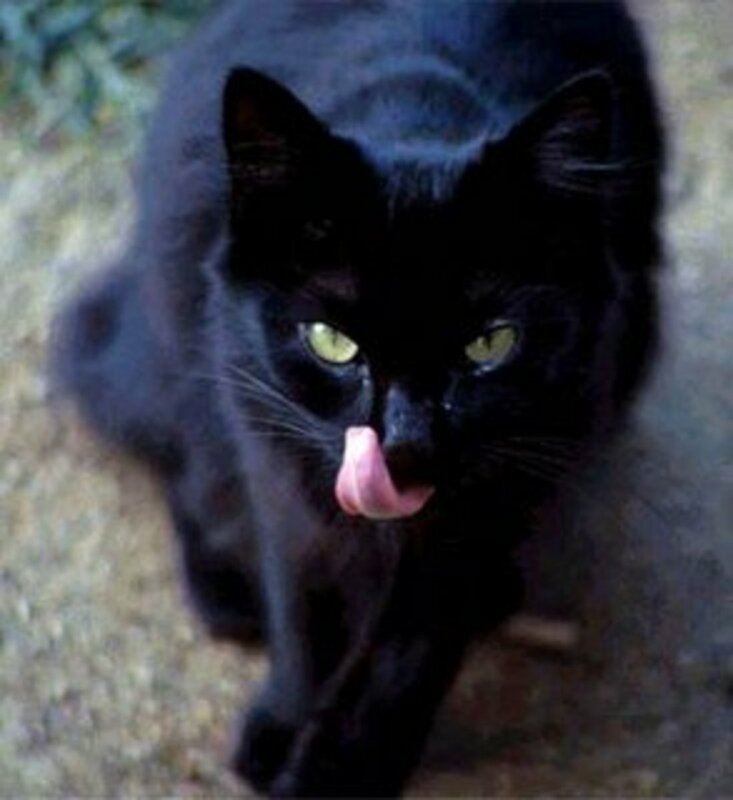 If a black cat comes your way, while a serious discussion is going on, it is considered to be a bad omen. When there is a birth or death in the family, the members are not supposed to go to a temple or light a lamp at home for 15 days. If a female's right hand is itchy, it is not good. It is an indication that she is going to get some bad news On the other hand, if it is the left hand that itches, then it is good. However, if a male's left hand is itchy, then it is not good. It shows that he is going to cry soon. He is lucky if his right hand is itchy. If the left eye of a woman twitches, then it is not good. It is also not good if a man's right eye is twitching. If you see a family member leaving the house for some purpose, and happen to ask him or her "where are you going?" the individual won't like it, because asking such a question is considered a bad omen. A number of activities and objects are to be avoided after sunset, such as: cutting of one's hair or nails, giving dirty linen to the dhobi, mentioning words that denote a snake or a barber, lending or giving needles, salt, butter, milk or white articles, lending a matchbox, or starting a fire for someone else. If somebody is leaving home for the day's work and you sneeze thrice, it's a bad omen. Tuesday is believed to be a bad day to reach anybody's home from a journey. If a married woman wears white clothes, it is considered inauspicious. If you hear a dog whining at night, it will bring bad luck (especially when someone in your family or neighbourhood is sick). Some people do not make payments on Fridays, except when giving small coins to beggars. 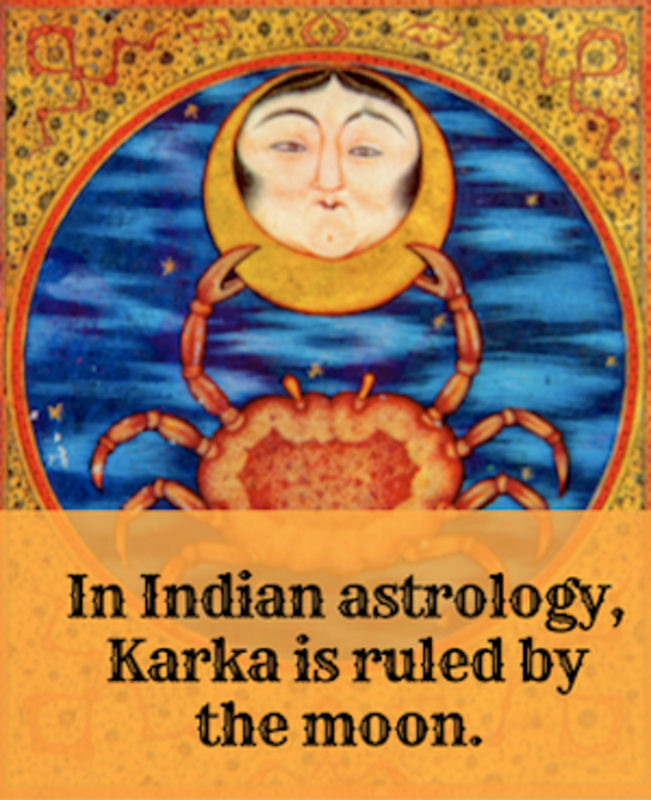 Astrology is an integral part of Indian culture. Even today, many people prefer to do good things, such as entering a newly made home (Gruhapravesha), fixing a marriage proposal, fixing a marriage date, entry of a bride to her new home, starting a new business, etc, according to their astrological belief. 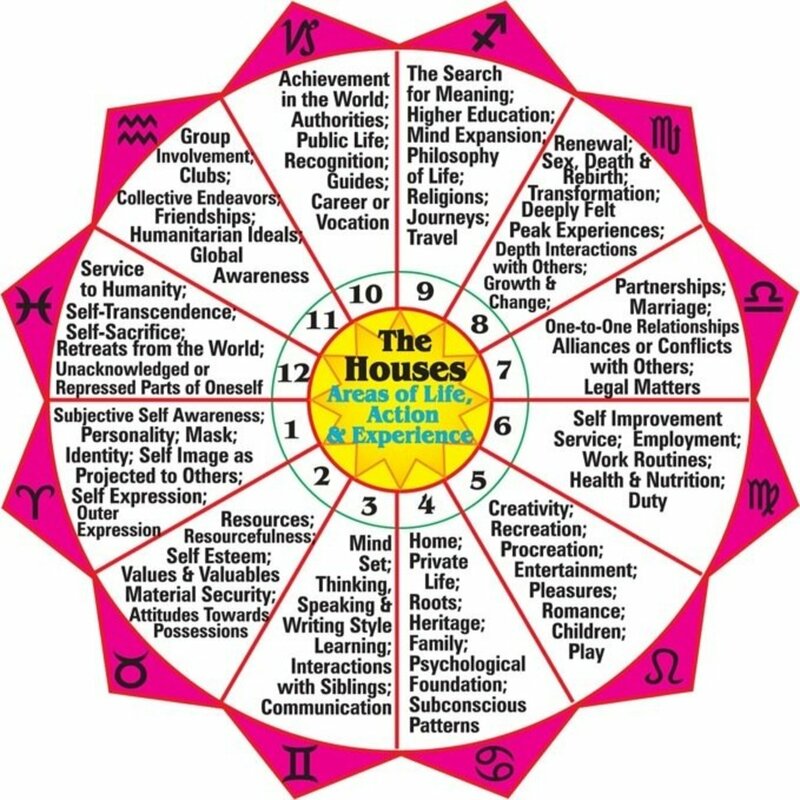 Let's learn how these astrological beliefs are categorized and structured. The Nirayana, or sidereal zodiac, is an imaginary belt of 360 degrees. Like the Sāyana, or tropical zodiac, it is divided into 12 equal parts. 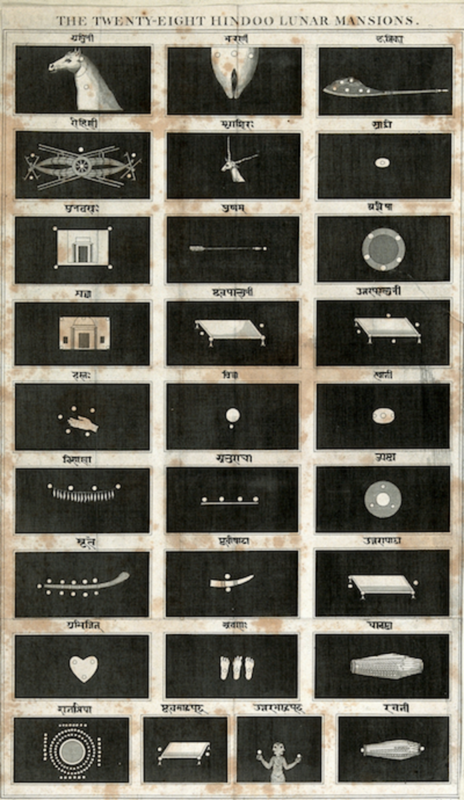 Each twelfth part is called a sign or rāśi, which, in Sanskrit, means "part". Vedic (Jyotiṣa) and Western zodiacs differ in their methods of measurement. Jyotiṣa uses the sidereal zodiac (in which stars are considered to be the fixed background against which the motions of the planets are measured). However, in most Western astrology, the tropical zodiac is used (the motion of the planets is measured against the position of the Sun on the Spring equinox). The placement of planets in the Jyotiṣa system is consistent with the actual zodiac. A nakṣatra is the lunar mansion. It is one of the 27 divisions of the sky, identified by the prominent star(s) in them. Historical (medieval) Hindu astrology enumerated either 27 or 28 nakṣatras. Today, a rigid system of 27 nakṣatras cover 13°20’ of the eclipticeach. The missing 28th nakshatra is Abhijeeta. Each nakṣatra is divided into quarters or padas of 3°20. The Abhiśeka Nakṣatra is of the greatest importance. Worshipping and propitiating this Nakṣatra has the power to remedy all the other Nakṣatras. Taking remedial measures go a long way in mitigating Karma. In Sanskrit, daśā means "planetary period" or "state of being." The Daśā governs the a person's state of being. The Daśā system shows which planets have become most active during the period of the Daśā. The ruling planet (the Daśānātha or "lord of the Daśā") eclipses the mind of the native, compelling him or her to act in accordance with the nature of the planet. What Are the Daśās Systems? There are several Daśās systems, each with its own utility. There are Daśās of Grahas (planets) as well as Daśās of the Rāśis (signs). The primary system used by astrologers is the Viṁśottarī Daśā system, which has been considered universally applicable in the Kaliyuga to all horoscopes. How Are the Daśās Determined? The first Mahā-Daśā is determined by the position of the natal Moon in accordance with a given Nakṣatra. The lord of the Nakṣatra governs the Daśā. Each Mahā-Dāśā is divided into sub-periods called bhuktis, or antar-daśās, which are proportional divisions of the maha-dasa. Further sub-divisions can be made. The next sub-division is called pratyantar-daśā, which can be divided into sookshma-antardasa. Sookshma-antardasa can be divided into praana-antardaśā, which can be sub-divided into deha-antardaśā. Such sub-divisions exist in all Daśā systems. Nine grahas (navagrahas) are used. In Sanskrit, graha means '"seizing, laying hold of, holding." The Nine Planets of Vedic Astrology, or Jyotiṣa, are the forces that capture or eclipse the mind. They represent the decision making of the human being. When the Grahas are active in their Daśās, or periodicities, they are empowered to direct the affairs of the person. Grahas are always busy capturing us in some way or other. Sometimes for the best, and sometimes for the worst. Meṣa have a strong work ethic. They have excellent people skills, long-term vision, and empathy. Vṛṣabha are steadfast, trustworthy, persistence, composed, self-reliance, constructive, practical, humourous, fearlessness, and stable. Mithuna are loving and quick witted, sometimes shy or retiring, humane, and have a good disposition. However, they are also nervous and restless. Karka are fond of change, novelty, and travelling. They are attached to their relatives and their home, inclined to public life, sympathetic, changeful, and impatient. Siṃha are ambitious, generous, honourable, frank, warmhearted, self-confident, fearless, impulsive, determined, preserving, and conscientious. They are also fond of power and distinction. Kanyā are excellent managers. They are thoughtful, sensitive, efficiency, cautious, intelligent, domestic, prudent, industrious, action-orientated, and intuitive. Although, they also have a tendency towards perfectionism. Tulā are loving, warm, and compassionate. This is one of the most charming of all the zodiac signs. Ruled by Venus, the Tulā man is a helpless romantic who loves being in love. He's rarely alone. He normally has a positive outlook on life. The Vṛścika-born are strong willed, passionate, intelligent, jealous, possessive, and secretive. They also know how to effortlessly grab the limelight, as they possess what it takes to achieve their goals. The Dhanuṣa man's personality traits and characteristics are fun loving, independent, and exciting. The Dhanuṣa man is, in some ways, the wild child of the zodiac. Adventurous, sociable, and friendly, they are typically determined to live life to the fullest. Makara are economical, prudent, self-willed, reserved, pensive, reasonable, thoughtful, and of a practical nature. They are calculating and business-like. Kumbha are serious, quiet, thoughtful, and of a contemplative nature. They are intelligent, cautious, prudent, economical, and practical. They are also outspoken, unselfish, humane, and impersonal. Mīna are selfless. They are always willing to help others, without hoping to get anything back. Mīna is a water sign and, as such, this zodiac sign is characterized by empathy. 4. Why Do We Still Follow These Beliefs? It is an interesting question. With the progress of science and pop culture, many of these superstitions have already lost their hold on the minds of the people. However, many of them are so deeply rooted that no amount of knowledge or science can weaken their hold or fully shake them off. When I discussed this question with some of my friends, the response was amazing. They belong to both the present generation of youngsters and the older generation. Though most of them don't want to believe these superstitions, they are not prepared to take the risk of ignoring them. Those who had ignored them had already faced some serious problems, which made them stick to the age-old beliefs again. It seems that, given how chaotic life can be, people still find a certain amount of comfort in thinking they can improve their lives by taking heed of these omens. My daughter had saved two newborn kittens from drowning and brought them home. One of them was black, and the other was white with a black dot on its face. Even though I was not fond of kittens walking around inside the house, I took care of these cute kittens. Many of our friends wanted to have the white one, but my daughter was not willing to part with them. Finally, a day came when we had to go to our native place for two weeks, and I was able to convince her to give these kittens away. We were amazed that there were no takers for the black one! I had to make a deal with a gardener to give the kitten a good home. While taking the cat, he promised me that he would definitely be able to find him a home in an estate, and that our dear kitten would be safe there among other cats. Later, to my amazement, I came to know that no one wanted to keep a black cat in their house or on an estate. Eventually, the kitten ran away from the gardener's house! Clearly, these superstitions are still deeply ingrained within the minds of many Indian people. Superstitions exist all over the world. Every culture and every country has their own share of beliefs. Some of them are funny, and some are logical. Some believe in these superstitions and follow them diligently, but others do not believe them, and choose to ignore them. Watch the two videos to know about some of the superstitions that exist in other cultures. Do you believe these age-old superstitions are good for us to continue? I am married to a Filipina and she has similar belief of Hindu superstition from morning to night. Are all Filipinos believe in Superstitions? How can we educate them? Any suggestions for these people? At the time of our ancestors there was no scientific development or any logical reasons known to them, they may have considered that their coincidences are done by either gods or demons.But after this much development also how can they believe them.And sir you have stated that you have discussed this topic with some of your friends and well-wishers and you have said that some of them tried to ignore them which had caused some negative effects,I agree with them because when we try to change or ignore them our friends,family or society we live in cannot digest the truth which is covered by superstitious beliefs from centuries old.And we can take a example in India if somebody sneezes when about to start a work is considered inauspicious,but when a train is about to start the locopilot will not see if there is a black cat is crossing or he is snezzing he will just start and run the train at its exact time. Thank you for the article. Superstitions, rituals and blind traditions are the root cause of unhappiness. It is easy to dramatise actions to make someone happy, but the true meaning lies in why we do what we do and whether there is a better way of doing it, instead of blindly following what generations have set. I have just returned from a trip to India where I spent an entire month in Kashi (Varanasi). I am a Shiva Bhakti from Australia and I am non-Indian so there were many occasions when "evil eye" became noticeable to me, as well as various forms of subtle energy which can harm you if you are not aware of your surroundings. The "evil eye" incidents became noticeable as a pain in my stomach or an uneasy feeling inside. Not to be confused with an actual stomach problem. Upon my return to Australia, I was yelled at by a man who did not approve of my saree and scarf and called me names and told me to f-off, this left me with the same feeling that I had in Kashi. This is a place where much energy is gathered, and whilst I believe that energy is impartial, it can still create a disturbance inside your body. I have had this occur on more than one occasion and I am telling you, you can feel it when it passes through you if there is enough of it. Also, people are very superstitious in India, this can also cause a subtle energy of its own and change the outcome of an event by planting a seed of doubt within your mind. I had a meeting with a Baba, who was quite delightful, our meeting left me feeling quite good, however, my superstitious friends warned me that he was trying to corrupt me and take my energy. They warned me to submerge the two shells he gave me in Maa Ganga and ask her for forgiveness and protection, wash all my clothes, hair, body and ornaments which I was wearing to make sure that his influence over me was gone. I did all of this because the power of their belief was confounding. I felt that I should do as they say on the strength of their conviction alone. Never underestimate the power and energy which is imbued into everything from the strength of people's belief. They are very religious people, they live and breathe it. This is to be respected rather than ridiculed. They live in an ongoing, continually maintained stream of ceremony and ancient tradition. Just because we do not understand them does not mean there is no reason, there is always a reason. We are calling these as superstitions because we don't know how they works.Self experience is the only way to know them. After prayers at the vinayagar temple ..i wanted to light up the ghee villaku for my son. With the ghee vilakku on plate in my hands while and want to light up while walking i tripped and fell and fractured my feet. Whats the significance. Hello, in my opinion superstition will somehow always be there until all the people of a particular society/country have decided to kick it out of their heads and completely ignore the rest of the people who are giving fake advises of it. Bat hanging in your balcony considered bad .Bat coming into your house flying also considered bad.They say it portends death. Robert, Thanks for reading and commenting. Glad to know that you found this hub interesting. I don't know much about the rationale behind some of them. While googling you may find it. Interesting hub--I have a fairly broad knowledge of Hinduism, but I didn't know about folk beliefs such as these. I would have liked to learn more about the rationale behind some of them. The belief that black cats are a bad omen is also a Western superstition, and I've read that Native Americans believe seeing an owl is inauspicious. Earlier some practices were there which were scientific, but with time people keep on adding things and thus when most of practices doesn't seem to work, younger generations call it superstitions . *cat crossing the way during important journey is bad omen. *Crying/hearing cries in the evening is a bad omen. *If a candle goes of again and again (particularly during some holy ritual etc ) is a really bad omen. Vice versa is bad omen. I booked my flight ticket to Vaishnav Devi shrine 2 months before. some one dies in our far family and I finish the funeral rituals, after this 3rd day for my departure to visit temple and i have not consult any one whether to visit the temple or not but i traveled & climb up the mountain and done the darshan of Mata Vaishnav Devi and Bairavnath temples and i went to 4 mata darshan as well. Now guide me some one it is good or bad.... i am just confused. India can never progress to full extent until she is superstitious. I'm sorry I don't know about it. Can the bride leaves the home on Friday for the wedding in different location? Please suggest..
Black cat isn't bad but it is believed that if we have black cat in house then we get protected from black magic. Just bcoz u haven't seen your great great great grandfather doesn't mean he never existed......our existence itself is the proof that they existed, its the same with superstitions. They lived in different circumstances and we live in diffeent situations. So i reckon that supestitions are time based. What we follow now are sure going to become superstitions in tge future.So accept the change and respect the old sayings. To follow them or not is completely a personal choice. what will happen if oil spill on the floor during pooja..
All these Superstitious culture is followed for a good life and to avoid any misshapen in family and a signal of any bad omen. All religion follow this type of superstition, but the people should know. Our ancestors no matter from which religion, they followed superstition culture. Now just saying we are modern, can't neglect those facts. There is good collection of beliefs here very informative. but may be you can add on some possible modern day explanation to it so that readers get a better insight. Like for e.g. why we cannot sweep in the night ... it could be because those days they did not have electricity and if they sweep in the night something important that had fallen down could be swept away. Very informative hub. Some superstitious beliefs are similar to the Philippines, like that with the black cat. Thanks for sharing. I strongly believe that eating curd with sugar before is NOT superstitous, is backed by science. It is well known that energy levels go up quickly, when sugar is consumed. Exams need heightened energy levels and nothing better than sugar. When a person is drunk, try giving him curd, and you see that the "kick" goes down rapidly. In other words, curd has the power to restore and maintain balance of your mind, something critical during exams.... this clearly is NOT superstition. Well, we don't have proof does not mean that proof does not exist. It takes time do consider all parameters for a research into a topic before making such statements. Example" I cant see an elephant 10 miles away does not mean that the elephant does not exist. It only means that my eyes can only see that far. Similarly all our senses can only sense that far. If I have to find the fact that the elephant actually exists I have to go there and see for myself. If science says that there is no proof this basically means that science has actually concluded everything i.e. there is no need to do any more research. How can science conclude that there is no proof when it still continues its research? Of course, some scientists are under pressure to give out theories for survival and they do make such statements. There are always 3 states to a statement: (1) It is true (2) It is false and (3)Don't know. In most cases of scientitic research which in most cases is materialistic by the way (3) is usually not considered a fair answer. all people who believe and follow superstitions.....i would only say that please have an inquisitive mind and question every thing rather than blindly following,may be the conditions when these rules were formed were different from present times, maybe these rules don't hold good for present practice...for example please answer me why would bhagwan not like people to clean their hair on certain days..after all cleanliness is next to godliness..
hinduism has many rituals which are sceintific. but we call it Superstitions only because we don't have reasons or evidence. this has happened because we fallowed the rituals taught to us by our elders but we never bothered to question the reason for rituals or asked for evidence. so we might have lost the reason or evidence. a very nicely written article with a lot of information. But one thing I would like to comment that we can completely reject all the rituals of Indians as Superstition as some of these are really based on scientific evidence. Just type on Google- 'Hinduism-most scientific religion' and you will get it. Thank you for your insightful comments, which will be helpful to our readers. Thanks abilash for reading adding your comment. Thank you for reading this hub and leaving your comment. I was not aware of this belief. Hope it will add value to the article. Thank vrajavala for your insightful comments. It definitely adds value to the hub. JUST LIKE THERE ARE SOME IN ALL CUTURES WHO DO NOT MAKE A VOCATION OF STUDYING THE sCRIPTURES, THERE ARE THOSE IN iNDIA WHo do not study the Holy Scriptures. Therefore, superstitions are prevalent amongst thodse groups who may have folklore and oral traditions as their mainstay. I do not think that the majority of Hinu people fall into this class. BTW, astrology is not a superstition, but was spoken by the great sage Parasara Muni over 5000 years ago, and is based on the precise movement of the planets. Thanks Nell for your visit and the encouraging comments. I do agree that not only in India, in many other countries too the age-old superstitions continue to a certain extent, which cannot be ignored easily. As you rightly said there must be a reason for them. Thanks again. I trust most of the beliefs.I need a favor from you guys..Actually there is a black Street cat which live on the walls of my house.It roam around the balcony of my house.Its not leaving My place.I want it to leave from my place.I tried my best but its negative.So if you guys know any trick to make it leave from my house please lemme know. Every culture has their own beliefs and superstitions and while I'm not prone to be superstitious, ocassionally I will cross my fingers behind my back, pick up a penny and knock on wood. I enjoyed learning about Indias'. Nice hub. You're very true images99. That is the way! They may sound surprising to some but that's how they are, nice collection.